Have you ever been walking through the woods and seen a bird, animal, or flower that just stopped you in your tracks? I had an experience like that in Northern Queensland. We had stopped at a camping area near Mt Carbine to look for birds in the dry forests in the area. For half and hour, we had been hiking around the campground checking on various things we saw and heard when we turned to walk down a grassy lane. I first saw the pair of rosellas feeding on the ground among short grass stems. These birds even at a distance stood out as striking in color and elegance. 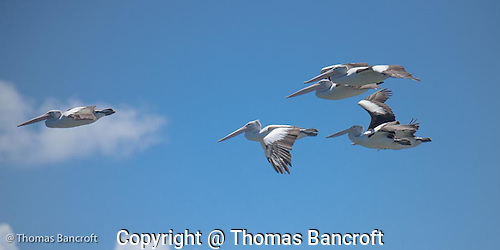 I began to creep forward, hoping not to flush them so I could have a closer look at their distinctive plumage. They grabbed ahold of grass stems pulling the stem through their beaks to strip the seeds from them. One also bit off small fresh light-green leaves from a short plant and ate the leaves. I must have frightened them for they flew up to a low branch beside the trail to eye me closely, but this perch gave me a chance to study their plumage. The birds had pale yellow feathers on the tops of their heads and napes that contrasted with their jet black eyes and dark eye ring and their white cheeks that had a light blue wash on its base. The feathers of their head, cheeks, and throat helped accent their greyish bill. The black feathers on their backs had crisp pale yellow margins giving their backs a scalloped texture and their steel grey-blue tail projected behind them almost the length of their body. These birds are a little over a foot long. Darker blue wings stood out against the other feathers. One turned around on the branch so I could see its bluish chest and belly feathers and the blood red vent feathers. The chest and belly feathers had a thin black scalloping to their edges. I suspect my mouth was open as I stared at these exquisite looking birds. Pale-headed rosellas nest in hollows in trees. The female incubates the eggs and the male feeds her during the incubation period. Both parents care for the young. 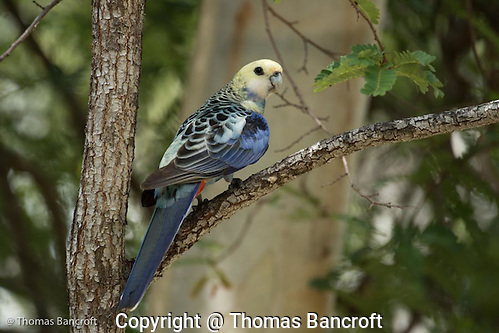 This species is closely related to the eastern rosella that replaces it in southeastern Australia. 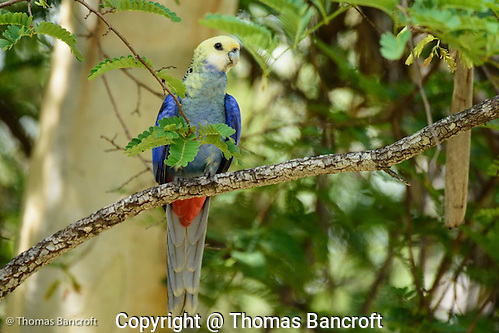 The eastern rosella has red feathers on their heads. Both species seem to be doing well and have adapted to suburban life as well as their natural dry forest habitat. I looked back several times as we climbed back up the little hill toward where we had parked our car. Still thrilled with the sighting. I would love to hear if you seen a bird or animal that has just taken your breath away? Saltwater Crocodile: What do these words bring to you?